I swear my garden is just sitting still. With all the chilly weather we’ve been having, plants are just creeping out of the ground, not bursting up with any kind of enthusiasm. Plus, cold, damp, dreary spring weather seems so much more miserable than the bitter temperatures of January and February. Part of the problem is undoubtedly that I’m outside wearing a spring jacket rather than an overcoat. But enough complaining. A post that features pictures of what is in bloom might help cheer us all up! My hellebores have been up and flowering since about the second week of March. 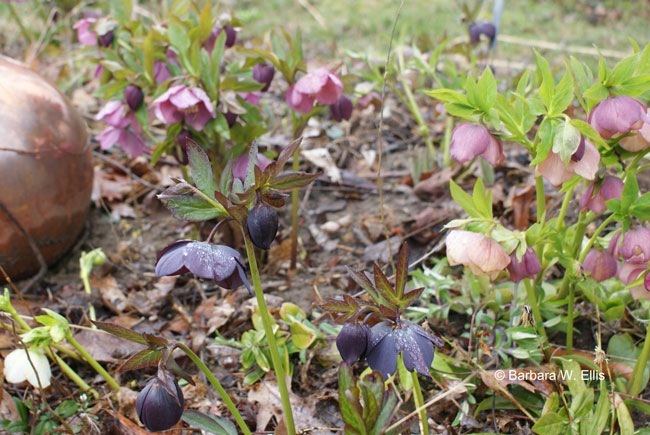 ABOVE: Hellebores (Helleborus x hybridus) in shades of pink plus black growing in a holding bed while awaiting a place in the garden. ABOVE: Helleborus x nigercours Gold Collection ‘Green Corsican’ has been an outstanding performer this year. Even before the hellebores bloomed, snowdrops (Galanthus nivalis) and winter aconites (Eranthis hyemalis) were in full flower. Plus I have a small clump of adonis (Adonis amurensis), one first perennials to bloom. All of these have finished flowering for the year, but I’ll include a picture of adonis here in hopes that more of you will search it out. It’s tough, pretty, early, and undemanding. What’s not to like? 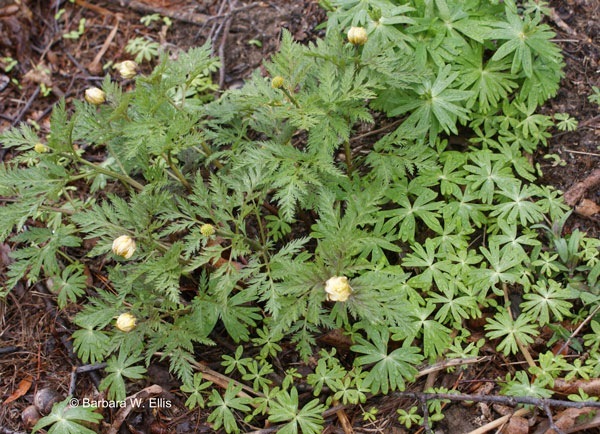 ABOVE: Adonis amurensis in early March. ABOVE: By March 30, the adonis blooms have faded but the ferny foliage is still pretty. 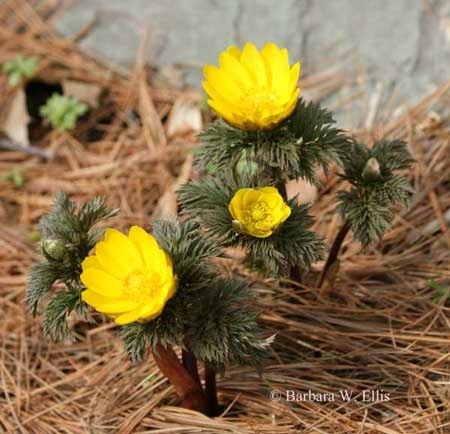 The small palm tree-like plants are winter aconite seedlings. 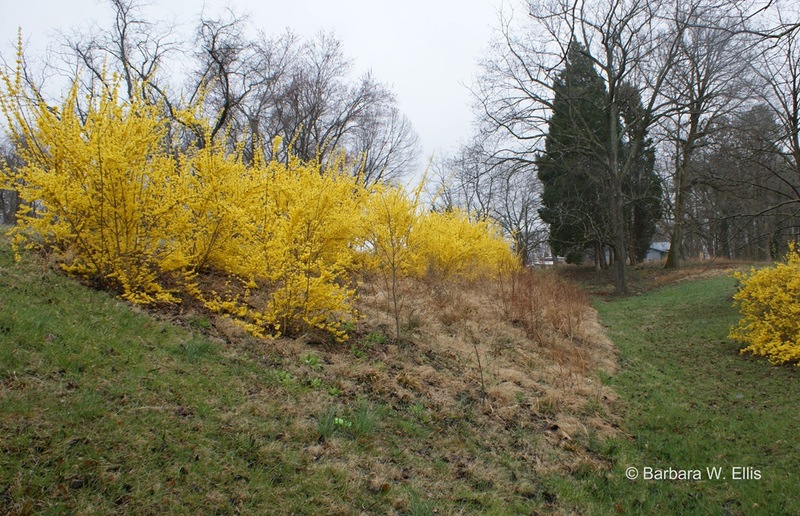 The other major feature of spring here is the forsythia hedge that runs along the road at the top of a steep hill on the edge of our property. I know forsythias are common, and some may look down their noses at them, but I can’t resist the masses of yellow flowers they bring to the garden early in the season. Plus, they bring great maroon foliage to the garden come fall and they are really, really low maintenance. ABOVE: Our steep roadside planting in 2009. It was planted in 2007. ABOVE: The roadside shrub border has filled in nicely by 2011. In addition to forsythia ‘Lynwood’, the planting includes ninebark (Physocarpa opulifolius Copertina/’Mindia’), cotoneasters, wigelia, and itea. Lawn in the foreground is in the neighboring yard and is still mown weekly. So, in its current incarnation, the planting is a wild thing, but the forsythias are finally thick enough to discourage my dogs from going rogue and wandering up toward the road. Another haircut soon after the flowers fade will encourage even more branching and thicken up the planting. 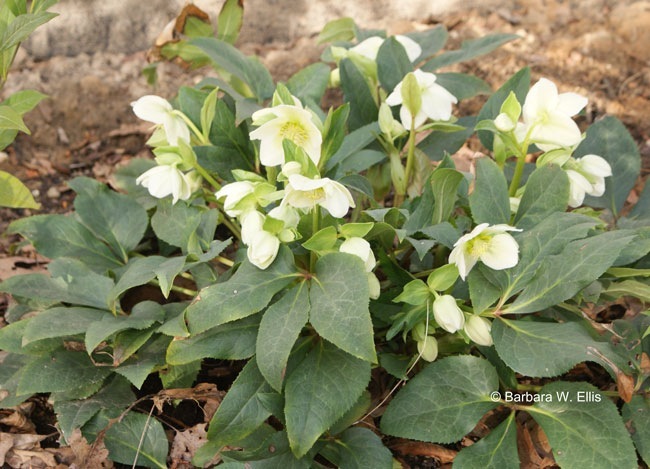 What’s Missing in the Garden this Spring? All this looking at what is in bloom makes me think about what I haven’t planted enough of yet. Although I’ve got a few daffodils here and there, more are definitely in order. Plus I don’t have any of the gorgeous blue scillas (Scilla spp.) either. I do have a couple clumps of glory of the snow (Chionodoxa sp.) that hopped a ride in pots of perennials that I moved down from Pennsylvania, but you can never have enough of those. So, I’ve already started a bulb list for this year. Fortunately, my Brent & Becky’s fall catalog has already arrived so I can start considering the options on all these dreary days when it seems to cold to work outside for long. I swear my garden is just sitting still. With all the chilly weather we’ve been having, plants are just creeping out of the ground, not bursting up with enthusiasm. Plus, cold, damp, dreary spring weather seems so much worse than the bitter temperatures of January and February. Part of the problem is undoubtedly that I’m outside wearing a spring jacket rather than an overcoat. But enough complaining. I though I would post a couple pictures of what is in bloom. My hellebores have been up and flowering since about the second week of March. Even before that, winter aconites (Eranthis hyemalis) and adonis (Adonis amurensis) were in full flower. 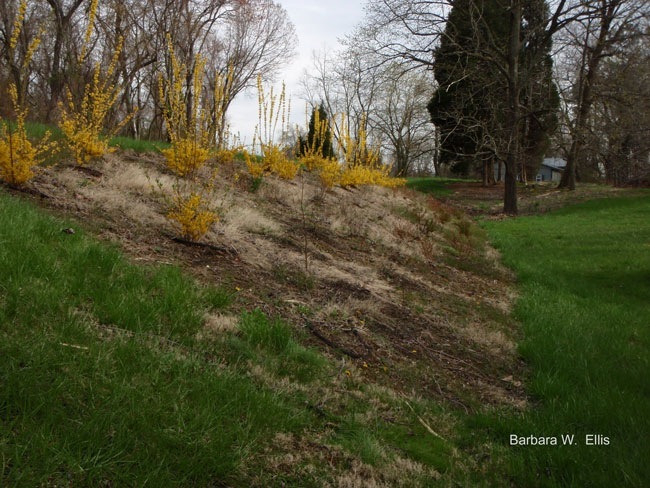 The other major feature of spring is the forsythia hedge that runs along our property along the road at the top of a steep hill. I know forsythias are common, and some may look down their noses at them, but I can’t resist the masses of yellow flowers they bring to the garden early in the season. Plus, they bring great maroon foliage to the garden come fall. So, in its current incarnation, the planting is a wild thing, but the forsythias are finally thick enough to discourage my dogs when they decide to go rogue and wander up toward the road. Another haircut soon after the flowers fade will encourage even more branching and thicken up the planting. All this looking at what is in bloom makes me think about what I haven’t planted enough of yet. Although I’ve got a few daffodils here and there, I definitely need more of them, though. Plus I don’t have any of the gorgeous blue scillas (Scilla spp.) either. I do have a couple clumps of glory of the snow (Chionodoxa sp.) that hopped a ride in pots of perennials that I moved down from Pennsylvania, but you can never have enough of those.